It’s Here . . . and It’s Bad! Well, this one snuck up on us! Invasive water hyacinth has been a huge problem in the lakes, rivers and streams of Africa, South America and the southeastern United States for many years. We thought we were protected from it up here in Wisconsin above the 40th parallel, the supposed northernmost reach of the plant. We were mistaken. Whether the fact that water hyacinth is now able to flourish this far north is due to climate change or that the plant has somehow adapted to cooler temperatures is irrelevant. What is relevant is that it’s here in Wisconsin and it has the potential to cause as much trouble as it has in warmer climates. 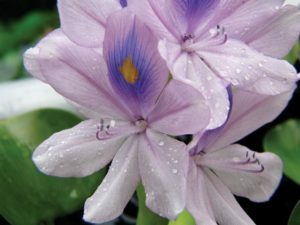 Like many invasive plants, water hyacinth was intentionally brought into the United States. Way back in 1884 it was introduced as an ornamental plant for water gardens at the Cotton States Expo in New Orleans. It escaped the confines of backyard water gardens and has become a serious weed of rivers, lakes, ponds, canals and reservoirs. As far back as the 1940s, the state of Louisiana was experiencing losses of $75 million a year due to water hyacinth. Large floating mats of water hyacinth displace native plants and animals, cause economic hardships to communities that depend on fishing and water sports for revenue, decrease waterfront property values, interfere with hunting, fishing, boating and other water sports, clog irrigation pumps and water supply pipelines and impede runoff and water circulation. The mats become mosquito factories, creating calm water for larvae to proliferate while denying access to mosquito larvae predators. Mats are so dense that they decrease light to submerged plants, depleting the water and animals that live in it of oxygen. Shifting mats have been known to prevent boaters from reaching their docks, stranding them offshore. Water hyacinth is an erect, free-floating perennial plant. It has thick, green, oval, waxy leaves up to 6” wide. Leaves form rosettes that can rise 1-3 feet above the surface of the water. Pretty six-petaled flowers are lavender blue with a yellow blotch on one petal of each flower. Up to 23 flowers may occur on a single spike. Feathery roots are submersed below water and are blue-black to dark purple. The flowers last about 14 days, after which the stalks bend down to release seeds into the water. A single plant can produce as many as 5,000 seeds. The small seeds sink and bury themselves in sediment below. No worries if conditions aren’t right for germination – seeds can remain viable for 15-20 years. The bad news is that seeds aren’t even the main way that water hyacinth plants reproduce. They also reproduce vegetatively, by producing daughter plants. In four months, two water hyacinth plants can produce 1,200 daughter plants. A population can double in as little as six days. A healthy acre of water hyacinth can weigh up to 200 tons, and still remain afloat! 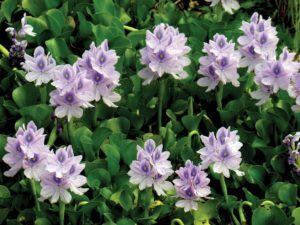 Water hyacinth supports little native wildlife and has few pests. It can tolerate extremes of water levels, flow velocity, water temperature, pH and nutrient availability. How do you fight that? The USDA has introduced two weevils, a moth, a mite and a fungus to try to control it, but the going is slow. These biological controls work just fine, but often can’t keep up with the explosive spread of water hyacinth. And just because the weevils, moths, mites and fungi are successful in warm climates doesn’t mean they can survive in cooler climates to do their good work. Pesticides have been used liberally and successfully to control water hyacinth in many areas, but they have a nasty way of killing everything they touch, including important native plants and animals. For small infestations, the best way to control water hyacinth is to physically remove it before it flowers and sets seed. You can do this. Get out in your boat and haul it aboard. Take it home and let it dry out on a hard surface like your driveway before composting, burning or trashing it. In autumn of 2015, water hyacinth was discovered near Winneconne at the confluence of the Wolf River and Lakes Winneconne and Butte des Morts, thanks to the sharp eyes of waterfront property owner Valerie Stabenow. She immediately reported her find to the DNR and within days a team of people from the DNR, UW-Extension and other agencies interested in aquatic invasives arrived to scout the area and physically remove the plants. Because of the early discovery and the quick response, the spread was contained before it became uncontrollable. However, in 2016 and in years to follow, monitoring will be necessary to be certain that it doesn’t return and gain a foothold. This is especially important since it wasn’t discovered in this area until October when it had already flowered and set seed for the year. Winneconne is a small village of 2,400 people that relies extensively on boaters, water skiers, jet skiers, swimmers, fishermen and waterfowl hunters to support its economy. It’s no exaggeration to say that if left unchecked, water hyacinth has the ability to shutter the town in a very short period of time. And that would be bad. Water Hyacinth is PROHIBITED in Wisconsin. This means you are not allowed to possess, transfer, transport or introduce it. You may possess and transport it in the process of working to remove it. If you have it in your pond or water garden, GET RID OF IT by removing it and letting it dry out before composting, burning or trashing it. You can help stop the spread of aquatic invasive plants! Rinse mud and debris from equipment and wading gear and drain water from boats before leaving the launch area. Remove all plant fragments from your boat, propeller, and boat trailer. The transportation of plant material on boats, trailers, and in live wells is the main introduction route to new lakes and rivers. Do not release aquarium or water garden plants into the wild. Instead, seal them in a plastic bag and dispose in the trash. Use plants native to Wisconsin in aquariums and water gardens.